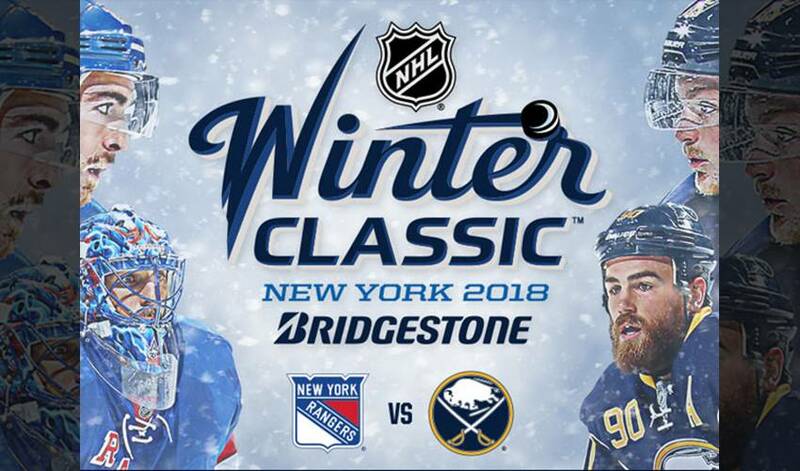 NEW YORK (May 9, 2017) – The 2018 Bridgestone NHL Winter Classic® will feature the Buffalo Sabres® and New York Rangers® on Jan. 1, 2018 at Citi Field, home of the New York Mets, the National Hockey League (NHL®) announced today. The New Year’s Day game will be broadcast live on NBC, Sportsnet and TVA Sports at 1 p.m. ET. Both the Sabres and Rangers will be making their second appearance in the NHL Winter Classic®. Buffalo hosted the first-ever NHL Winter Classic® against the Pittsburgh Penguins, a 2-1 shootout loss in front of 71,217 fans at Ralph Wilson Stadium on Jan. 1, 2008. New York defeated the hometown Philadelphia Flyers at Citizens Bank Park at the 2012 Bridgestone NHL Winter Classic® on Jan. 2, 2012, by a score of 3-2. Additional details on the 2018 Bridgestone NHL Winter Classic®, including ticket information and other events surrounding the game, will be announced in the coming months. Updates also will be available on www.NHL.com/WinterClassic. The intrastate rivals have faced off in 177 regular-season games since the 1970-71 season, with the Sabres holding a 196-172 edge in points over the Rangers (BUF 81-62-34—196; NYR 71-76-30—172). In addition, the Sabres and Rangers have met twice in the Stanley Cup® Playoffs, with Buffalo winning both best-of-seven series, including their most recent matchup in the 2007 Eastern Conference Semifinals. The 2018 Bridgestone NHL Winter Classic® continues the tradition the League established in 2008 of hosting a regular-season outdoor game at the onset of the new year. This year’s edition will mark the 10-year anniversary of the first NHL Winter Classic® and highlight top talent in the League from both teams. The Sabres top scorers from the 2016-17 season include forwards Jack Eichel, Ryan O’Reilly and Sam Reinhart. The Rangers counter with forward Mats Zuccarello, who led the club in scoring in 2016-17, 2017 NHL All-Star Ryan McDonagh and veteran goalie Henrik Lundqvist. Bridgestone, the Official Tire of the NHL® and NHLPA, returns as title sponsor for a ninth consecutive year. Over the past decade, the Bridgestone NHL Winter Classic® has become a tentpole hockey event on the North American sporting calendar. Five of the six most-watched NHL regular-season games in the U.S. since 1975 are Bridgestone NHL Winter Classic® games. The company recently extended its partnership with the League through 2021. Citi Field, home of Major League Baseball’s New York Mets, is a world-class venue that has hosted numerous marquee events, including the 2015 World Series, 2013 Major League Baseball All-Star Game, and sold out concerts by Beyoncé, Dave Matthews Band, Paul McCartney, and the Zac Brown Band. This summer, the Classic East – featuring the Eagles and Fleetwood Mac – will come to Citi Field, as will Lady Gaga. The 2018 Bridgestone NHL Winter Classic® will be the sixth NHL Winter Classic® to be held in a baseball stadium, with the iconic New Year’s Day game previously held at Wrigley Field in Chicago (2009), Fenway Park in Boston (2010), Citizens Bank Park in Philadelphia (2012), Nationals Park in Washington (2015) and Busch Stadium in St. Louis (2017). NHL Network™ and NHL.com will provide extensive coverage live from the event leading up to and after the game. NHL Social™ will have exclusive coverage on all social platforms, including the use of the hashtag NHL #WinterClassic.